In order to access the online Request for CEUs application, you will need to login to our certification system with the email address we have on file for you and your password. If you have forgotten your password, simply click on “Forgot my Password” and a reset code will be emailed to you. You’ll then create a new password and login. If you do not have a contact record in our system, you will need to create one by clicking on Create Account under First Time Visitors. A confirmation email will be sent to you and will contain their password. Once you have logged in, you’ll begin the process. Your contact information will be auto-filled for you (based on the information we have for you in our certification system). If any information needs to be updated, you may simply overwrite it. Then, scroll down to the Meeting Information section and complete the fields (there are descriptive boxes on the right, noting what information should be put in the fields). Fill in the fields in the box titled “Meeting Location #1”. Next you will see a box with the question “Do you have another meeting location or time option?” If you are holding the same meeting that you filled in for Meeting Location #1, in another location, click on “Add an additional location and time” button (i.e. you are holding the exact same meeting on Monday in Madison and on Thursday in Milwaukee). If you are holding a meeting with a series of meeting times but consider it one meeting, do not add a location/time (i.e. Fundamentals in Agronomy meets every Monday evening for two months but the entire series is part of ONE meeting). If you have any supporting documents, you may then attach them – up to a total of five documents. Examples include agendas, programs, handouts, flyers, past PPTs, etc. You may submit documents in the following formats: gif, jpg, png, rtf, doc, docx, pdf, ppt, xls, and xlsx. Note that the maximum file size is 3MB per file. Finally, indicate the number of CEUs requested per category. The overall total will be calculated automatically. This is the step to add the individual sessions to your meeting. Enter the Session Title field. In the box below the title, enter the relevant information for that session, including the speaker name and bio/background. Like in step one above, if you are holding the same meeting in another location at a different day/time, click on the “Specify another location, time, and/or speaker” button and complete the same information, selecting a different location than the one that you input information for above. Select the relevant CEU area from the drop down box and note the number of CEUs for the session. Do this for each session. Note that there is a built in calculator – if you reach the overall total of CEUs requested, the system will take you to Step 3. If you do not reach the overall total of CEUs requested, the system will ask you to add more sessions using the steps above. At this screen, you may click on Review Your Application for a complete application of what you have submitted. You may print the application for your records. You may also add any notes for the reviewer. When everything is complete, simply click the “Submit Your Application” button. Your application will be submitted to the board contact responsible for CEU application reviews. You will be notified via email when your application has been reviewed. In the meantime, if you have any questions, please contact us or your IL CCA Program Coordinator Lisa Martin. 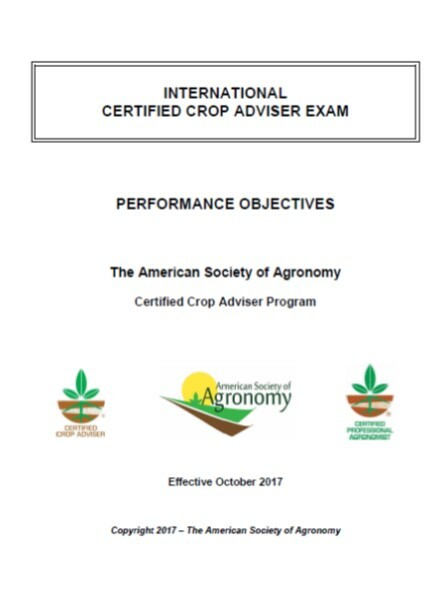 The Certified Crop Adviser Program (CCA) is one of the professional certification programs offered by the American Society of Agronomy (ASA). It is a voluntary program providing a base level of standard through testing and raising that standard through continuing education. The program is administered locally by 37 state/regional/provincial boards called "Local Boards" throughout the United States and Canada. Each CCA had to pass two exams (international and local) and submit credentials detailing their education, crop advising experience plus two references. They must sign and adhere to a code of ethics. The exams cover four major competency areas: nutrient management, soil and water management, integrated pest management and crop management. Continuing education must also fall into one of these four areas to be valid for CCA Continuing Education Units (CEUs). Click here for a map of CCA Participants. Check back for more information on CCA Logo Items and Decals.